Today was not a perfume-testing day. I felt like a middle-schooler on the first day of summer break: drinking in the freedom until it got to my head like little bubbles of joy, not knowing what to do with all this skin space. I let myself go to town. Started the morning with a healthy dose of very vintage Maja along with my morning tea. They clashed marvelously and I didn't care one bit. I can pick up the scent of Maja in my dreams, since it's part of my earliest perfume memories. I went about my morning. Emails, social media, a few texts, blog stuff. Had cereal for lunch because I could, did more blog stuff, switched perfume to Gris Clair so I could go out and run some errands without getting weird looks at Target. When I got home I saved a bunch of samples that Bob has sent flying when he took a less than graceful jump. I touched a mini of Alexis Karl's Body Made Luminous and it's exquisite residue remained on my fingers (some is still there, even now). At some point in the afternoon I started s-l-o-w-l-y going through the piles of stuff in my dressing room, putting things away for future testing, adding a layer of blue eye shadow because it was there, a highlighter, taking a sniff of Tam Dow because there was an extra sample at some nook or cranny, rubbing hand cream and a cuticle oil, sniffing a new Lancome lipstick and since Lizzy was right there with me (she's the least destructive cat in the world) I also huffed the back of her neck (Shalimar and Tuna). I put a few decants away and found a completely forgotten bottle of a very vintage Ultima. Tried to remember which friend asked me about it recently. Decided it must have been Josie and sprayed myself silly with this dirty skanky beast. I did more stuff around the house, medicated Peter, cleansed my face, changed clothes and absentmindedly gave myself a good dosing from the bottle of Vanille Ambre by Comptoir Sud Pacifique that I've been moving around from room to room the last several weeks. Then I realized what I was wearing. Vanille Ambre belongs to the small but much-loved category of guilty pleasure perfumes I own. It's the fluffiest of all fluff, free of serious thoughts or any respectability. Last month I had my seven year old niece try this CSP perfume and she declared that it smelled like granny's sugar cookies and refused to wear it. I'd dare say that my mom's cookies have a touch more complexity thanks to the butter and careful baking time. But little Shelley pegged the sugary treat character of Vanille Ambre. This is a spun sugar kind of thing, laced with a sugary amber and sprinkled with a faint hint of milk chocolate dust. It's dessert, and not trying to be anything else. No booze, no smoke, no wood. Just straight on vanillic sugar, the kind my mom keeps stocked in her pantry in semi-commercial hoardery amounts (I may or may not tend to so the same). Maybe that's what Shelley was thinking about. CSP Vanille Ambre is not something I consider a comfort scent. It's too bubbly, giggly, and pink. It's energizing in its weird little way, reminding you not to take anyone and anything too seriously, and also: start moving and do something fun. Or nice. Or productive. Just go and do it engulfed in this little cloud of pink cotton candy. It has to be a good day. (Now you'll have to excuse me as I go to finish the rest of my skincare routine, take a shower, and wear vintage Mitsouko to bed). Comptoir Sud Pacifique- Vanille Ambre ($32, 1oz eau de toilette) is available at Sephora. 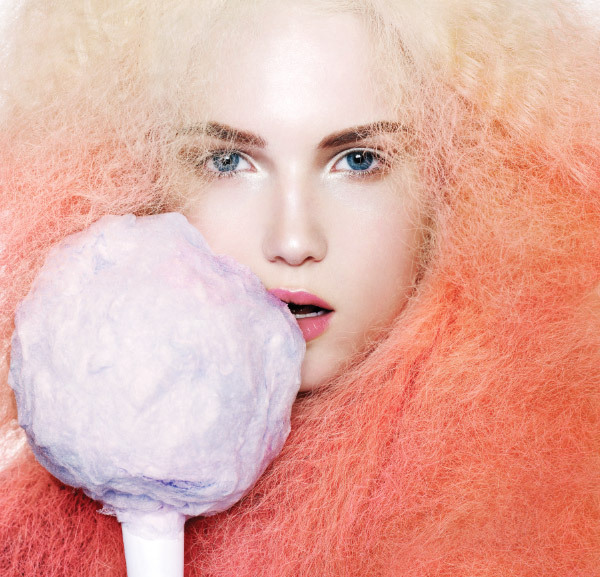 Image: Natasha V for fashionmagazine.com, April 2012. Hi.....I am interested in picking up some Maja and am wondering if I should buy perfume or EDT? I have only used this scent in the soap form and love it. Thanks for sharing your wonderful scent filled day! Sounds like a great day! And I am going to go get out my Vanille Ambre and a couple of other CSPs I own and really enjoy as wonderfully lighthearted breaks in my perfume wearing routine. They're unapologetically fun scents that inevitably make me smile and feel somewhat silly when wearing them - a very good thing. 1) they are summer scents. 3. I defy anyone to not melt at the combination of a CSP scent and Hawaiian Tropic Oil!